Spoiler alert: It’s a gamechanger, and you don't have to be a vegetarian to like it. I’ve been a vegetarian for a few months now, and it’s been way easier than you’d think. I don’t miss having chicken on my tacos (when seasoned correctly, mushrooms, beans and peppers are just as satisfying), and when it comes to brunch, I much prefer an extra waffle to a few slices of bacon. But ever since I became a vegetarian, there’s just one food that I can’t stop craving: a cheeseburger. RELATED: Our 27 Favorite Burger Recipes—Beef, Salmon & Chicken Included! It’s not like I used to eat cheeseburgers daily, but ever since I officially stopped eating meat, I keep getting the urge to order one, medium well with fries at every restaurant I go to. And while I’ve strongly considered allowing myself that one cheat meal, I can’t imagine my stomach would be very happy with me. I’ve tried plenty of veggie burgers, and while I like them, none of them come close to the taste or texture of a real, beefy burger. Until I tried the Impossible Burger. So what’s in the burger? Well, the 2.0 patty is mostly made out of water, soy protein concentrate, coconut oil, sunflower oil and natural flavors, according to the Impossible Foods website. It’s free of cholesterol and lower in calories than a normal burger and has 30% less sodium than the original Impossible Burger. I chose the Impossible Trufflemaker, which besides the patty, had a miso mustard, charred green chili salsa, truffle fondue, truffled aioli, port wine, truffle glaze, curly lettuce and tomato. After just one bite, I was hooked. It tastes almost exactly like a real burger! The patty was more similar to meat than any fake meat I’ve ever tried and it completely cured my craving. I’d heard that the Impossible Burger actually “bleeds,” and while I’m not sure what it’s bleeding, this is true. It was realistically juicy and delicious, and thanks to all the truffled toppings, the Trufflemaker was just as messy as a typical cheeseburger. 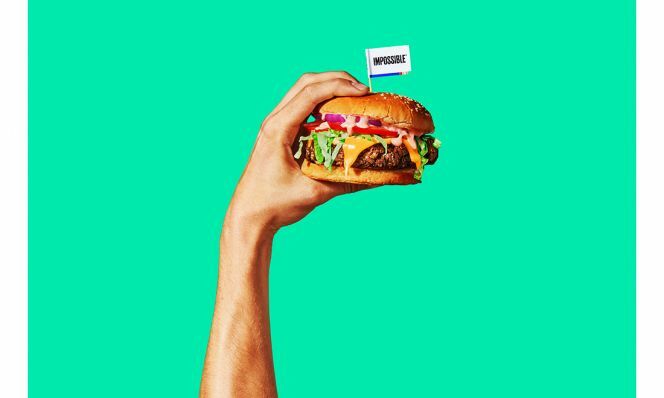 For any burger lover trying to eat less meat, the Impossible Burger is a definite game changer—I know I’ll be indulging in one at least once a month. Honestly even if you will never give up meat completely, I dare you to give this vegan burger a try.